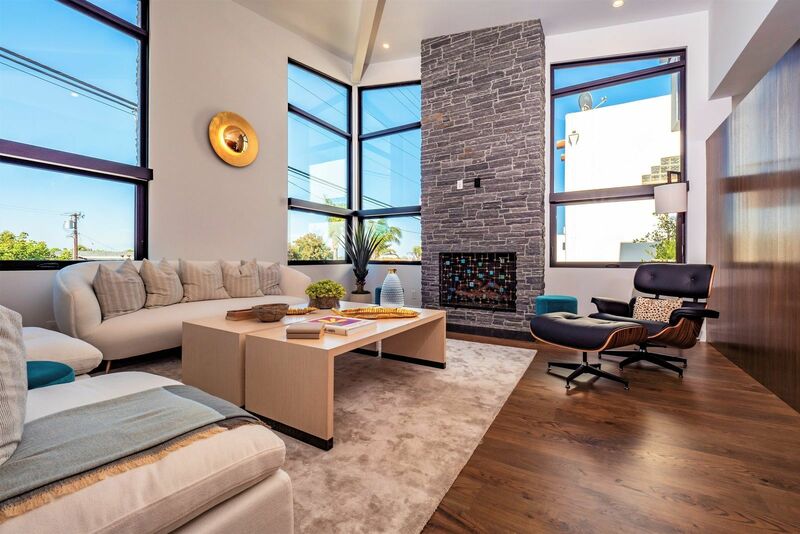 A Modern Mid-Century brings the Strand to the Hill. 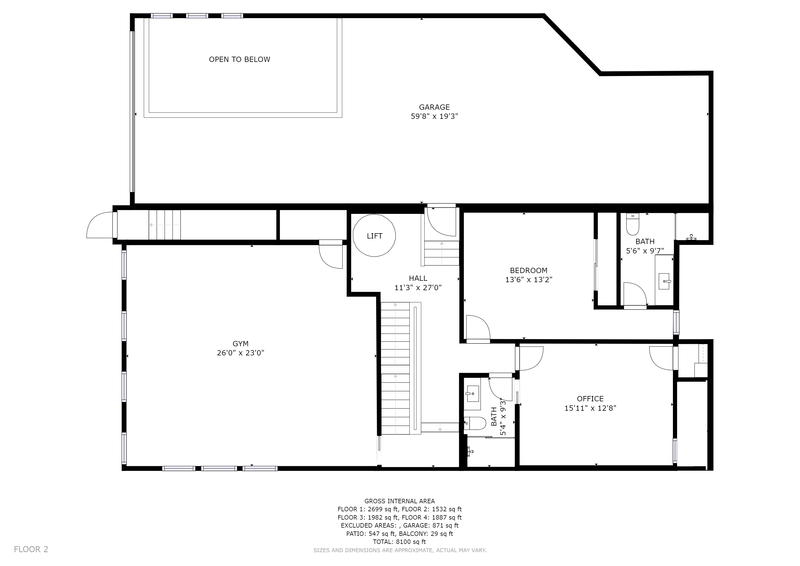 Salzman Design Build, Inc. presents HillHouse No. 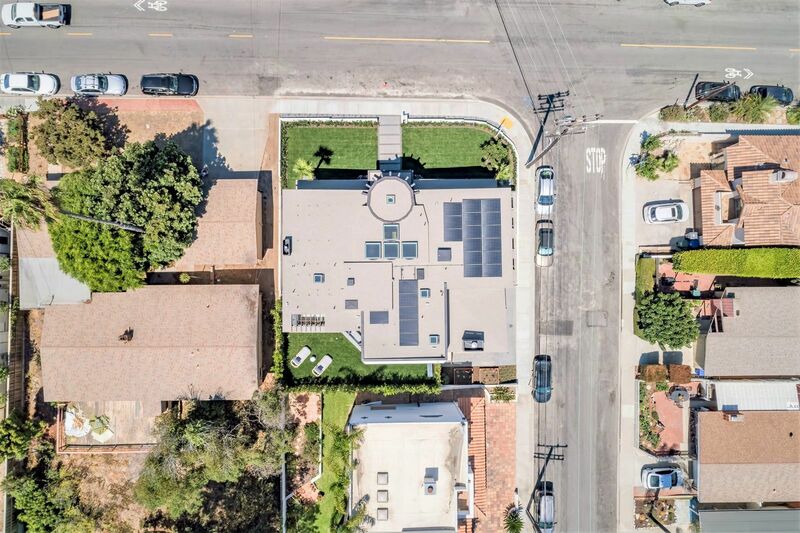 6, a landmark home that sets a new standard for development in the South Bay. 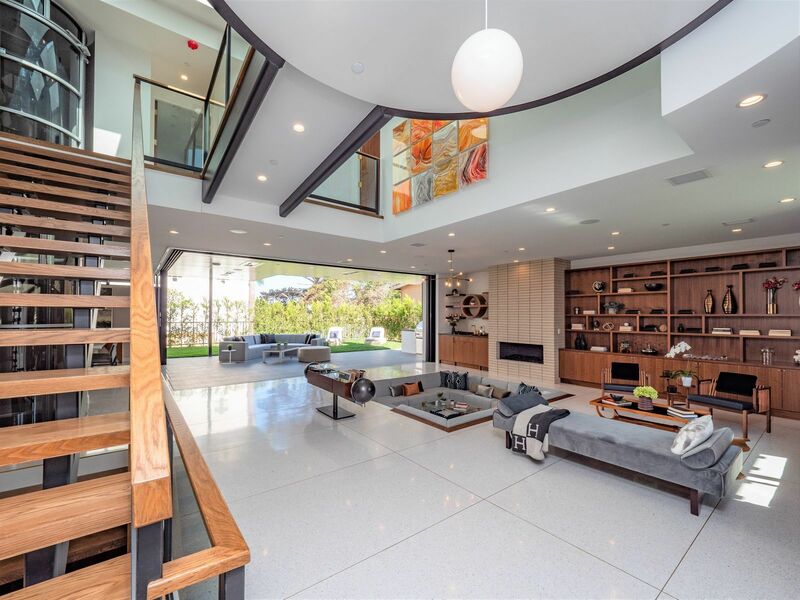 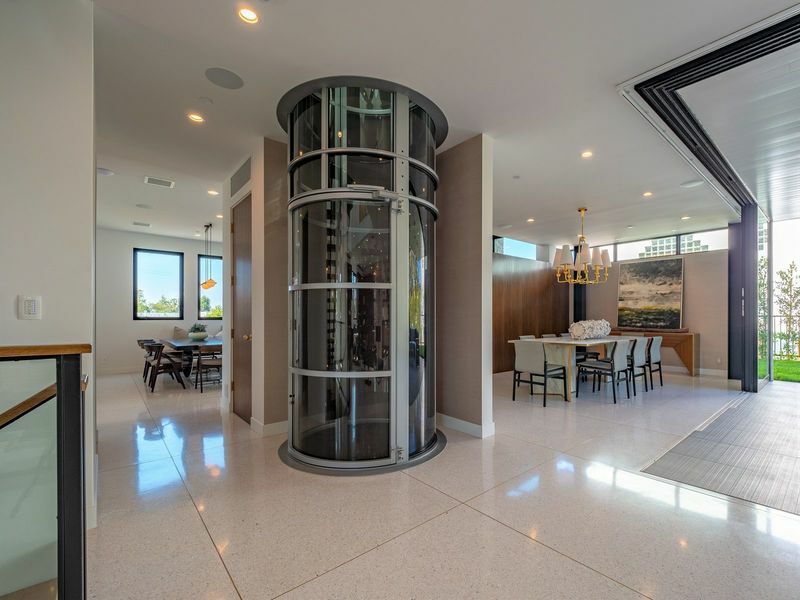 Conceived and built by Daniel Salzman over a five year design and build process that drew inspiration from the midcentury masterpieces of architectural giants Eero Saarinen and A. Quincy Jones, HillHouse No. 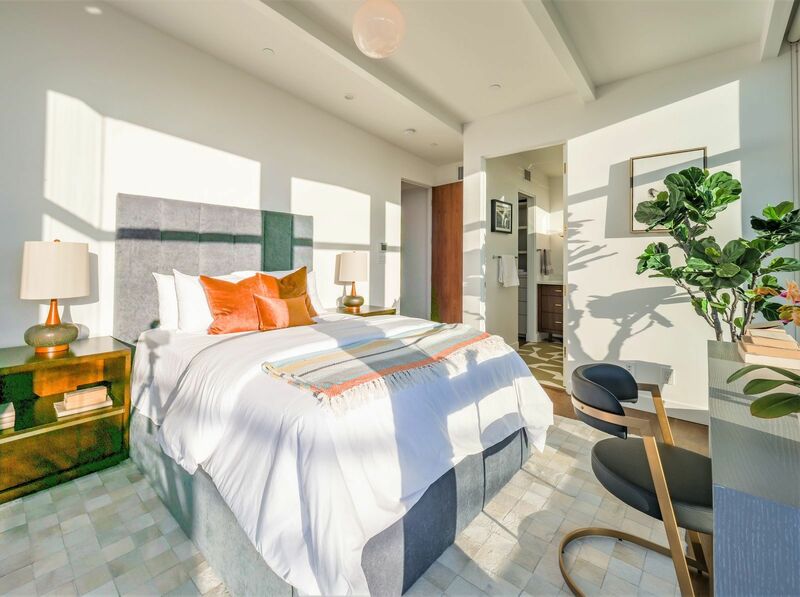 6 was built by a dream team of creatives and craftsmen, led by contractor Gary Stiles, with architectural design by Kelly Hamm, AIA. 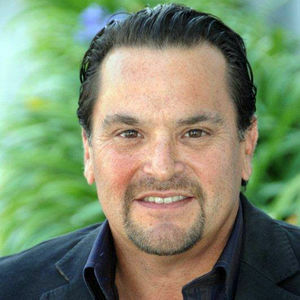 The home features exclusive interiors by Arianna Sabra, kitchen design by noted cooking instructor/author Pamela Salzman, and curated materials from South Bay Green Design. 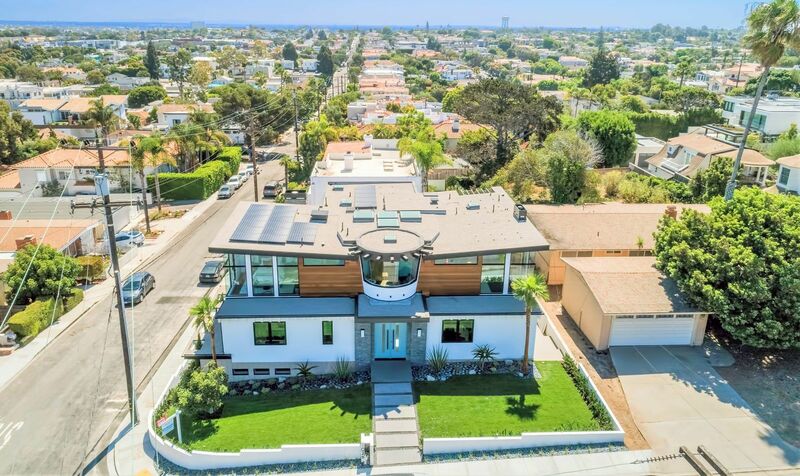 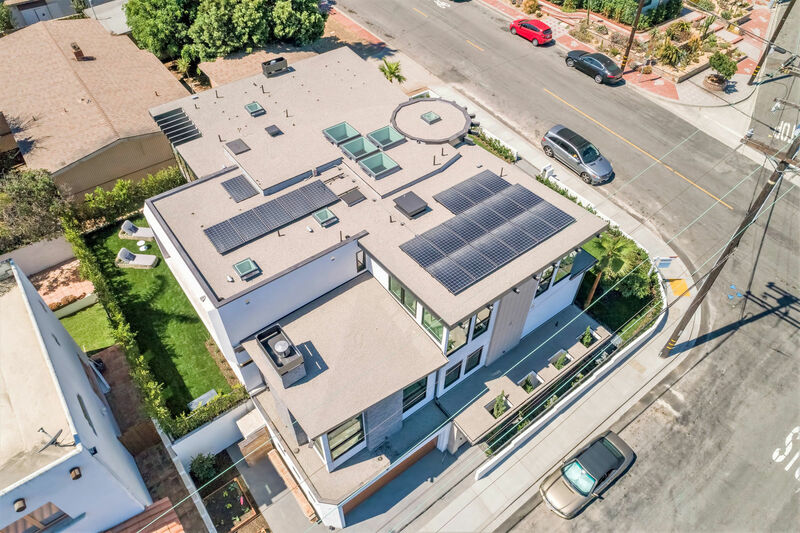 An engineering marvel, 1026 Pacific sits at the gateway to Manhattan Beach’s finest estates in the Hill Section, with approximately 7161 SF (per architecture plans btv) of living space spanning four levels, with 2229 SF (per architecture plans btv) of garage and storage space. 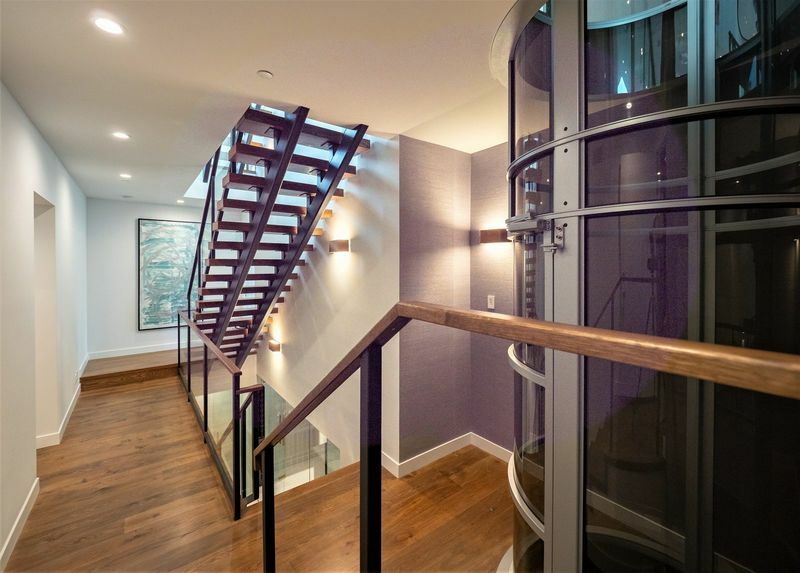 All this is accessed by incredible floating staircases and a levitating 52” cylindrical vacuum elevator with four stops. 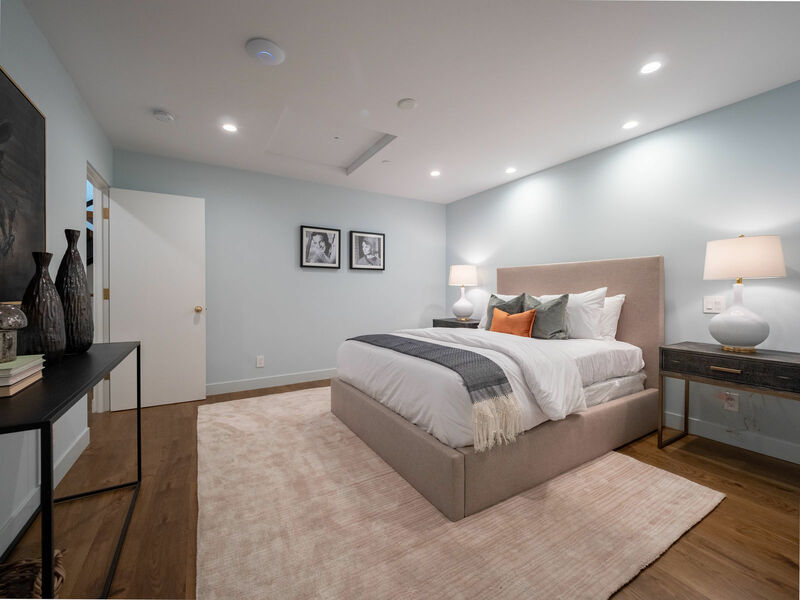 The home has several sophisticated modern amenities -- including full home automation with touchscreens, programmable keypads, and app-driven control for lighting, AV, security, window treatments, and climate control. 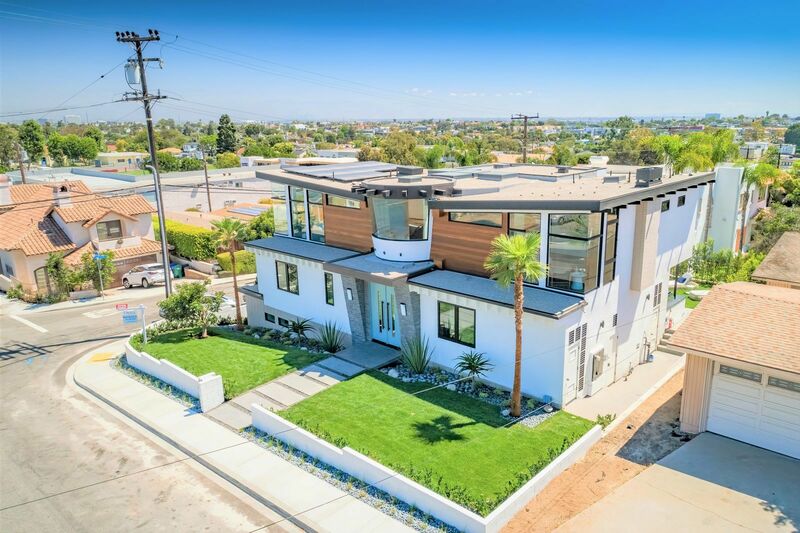 The home features an incredible 11 zones of heating and cooling for the ultimate in personalized climate control. 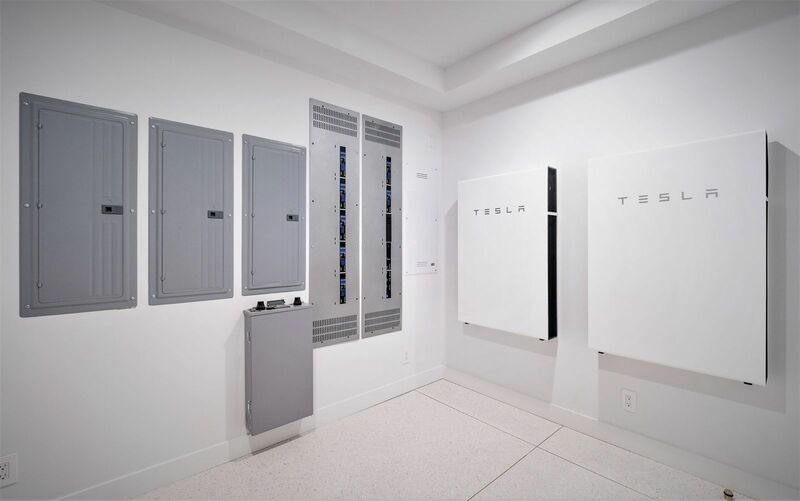 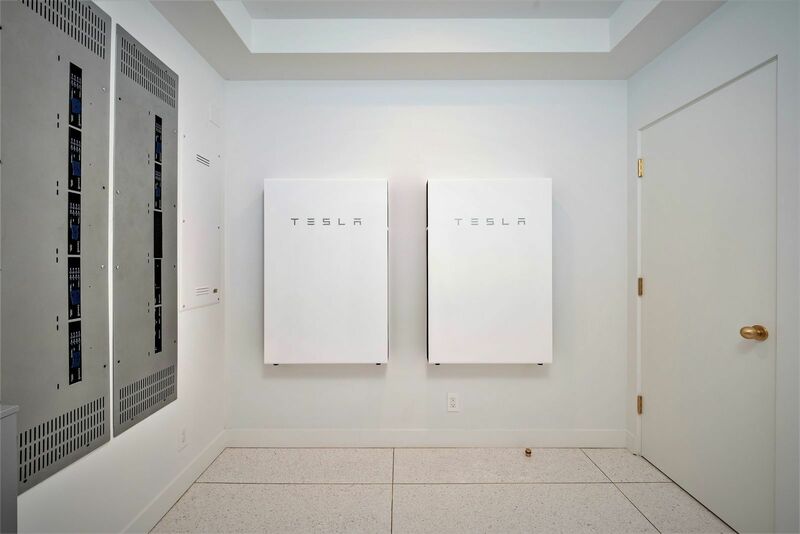 Energy efficiency abounds, with solar panels on the roof, and a pair of Tesla PowerWall 2 backup batteries providing power in the event of an emergency. 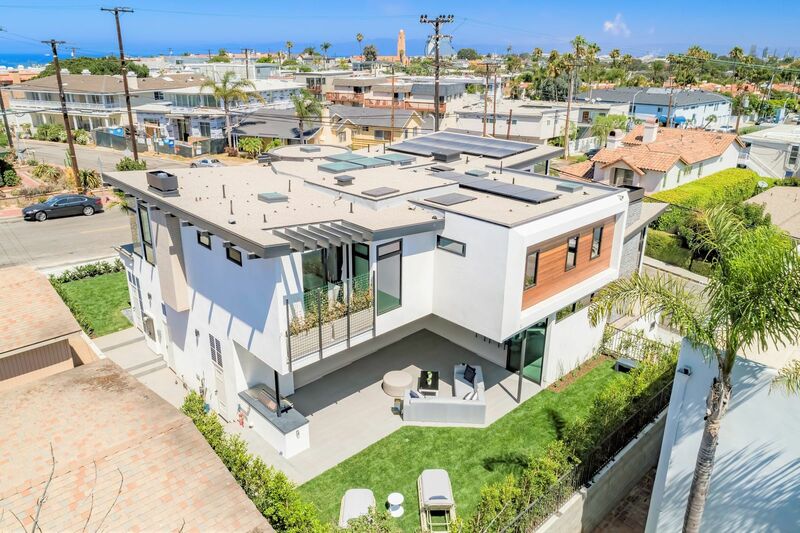 The envelope of the home follows green-building protocols, with superior insulation throughout the house -- every wall, ceiling, and a floor is insulated with green formaldehyde-free insulation, including blown roof insulation at an incredible R50 rating. 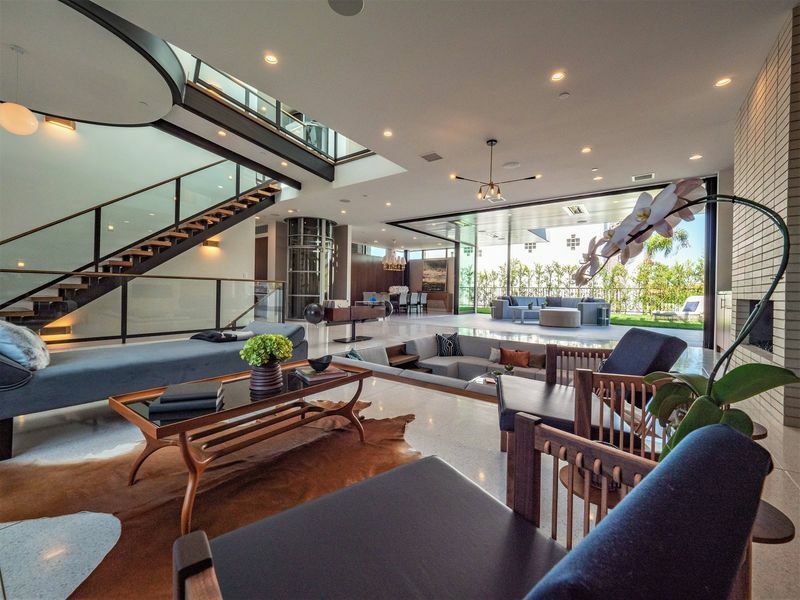 The home is stylistically tied to midcentury principles with a decidedly contemporary flair, seen through the adaptive use of materials -- many of them with recycled content -- natural woods, no-VOC paints and finishes, textural eco-friendly seagrass wall coverings, and warm brushed brass accents. 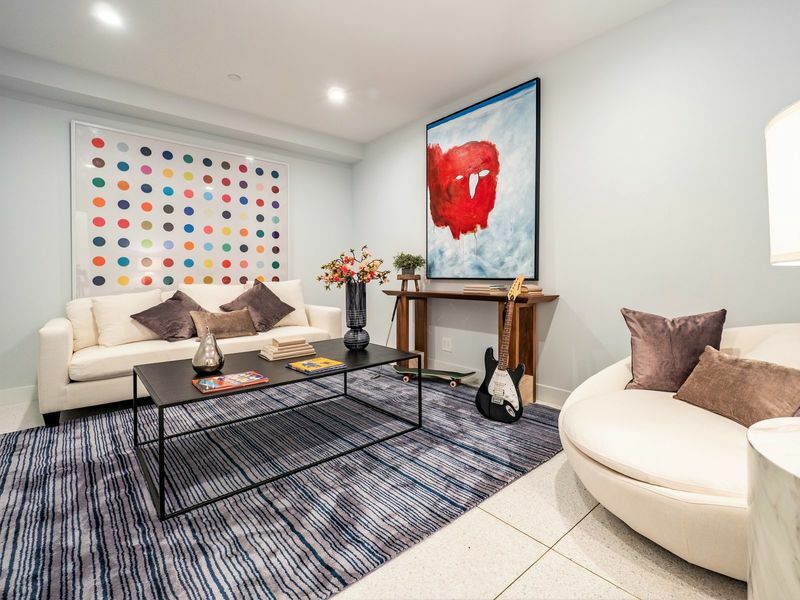 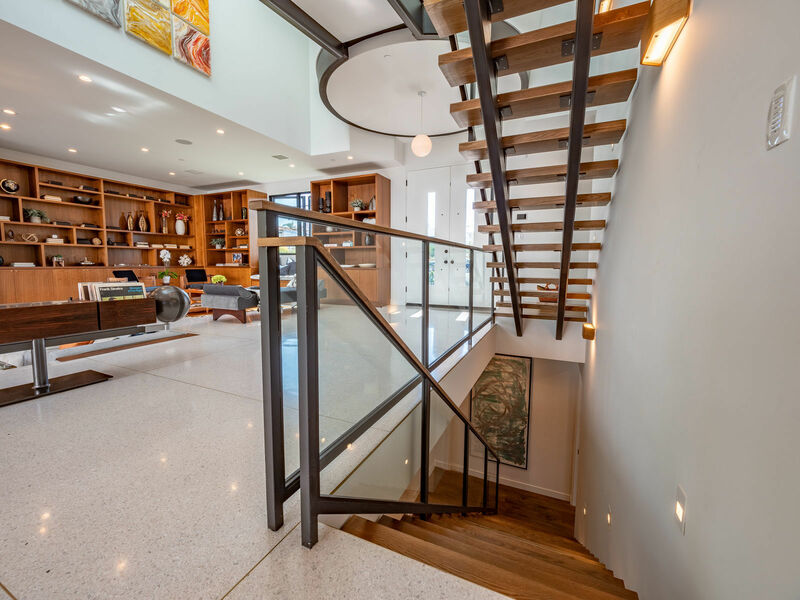 The flooring features custom, large format 8-foot terrazzo tiles with striking exposed aggregate, and European White Oak flooring with a custom stain finished with hard wax oil. 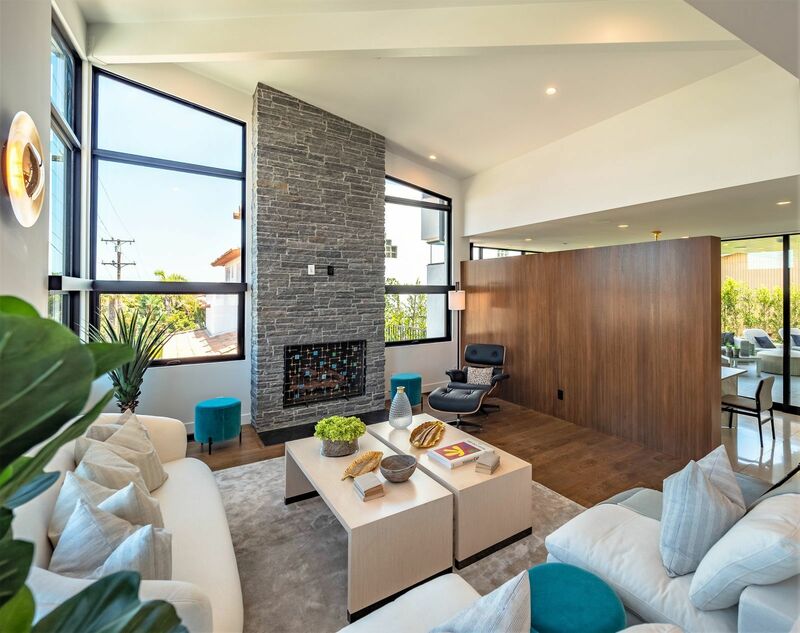 Public rooms feature large slab walnut doors throughout the home. 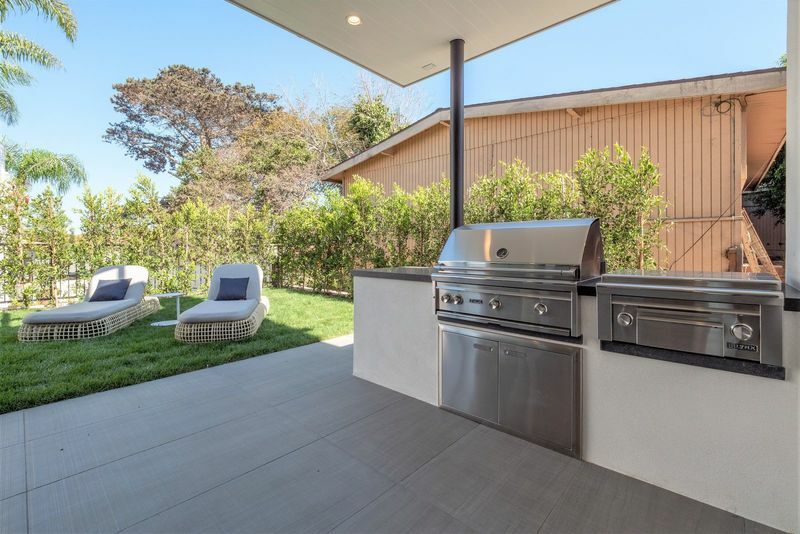 Outside, the house has a lush landscaping design with specimen trees extending through roof apertures, dramatic palm trees and drought-tolerant succulents juxtaposed with grasses and pebbles all washed with landscape lighting. 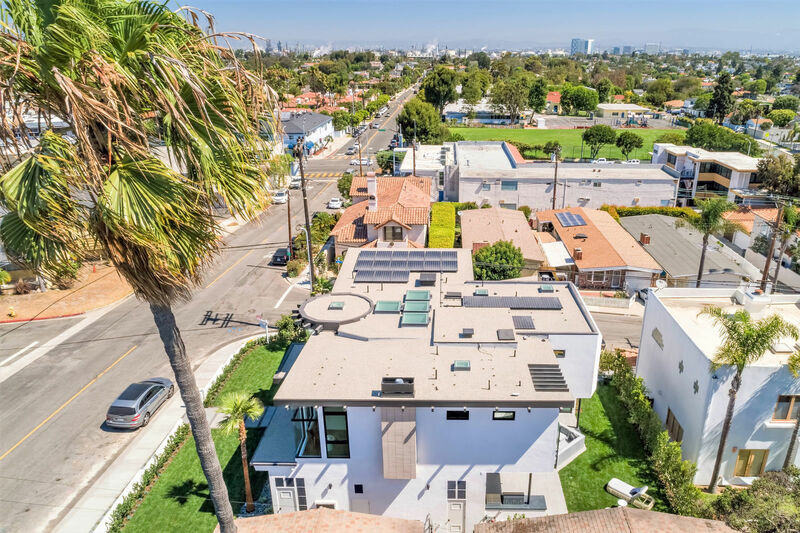 The rear yard is prepped for a potential future swimming pool and has a flat grassy area with a hedge of trees for privacy. 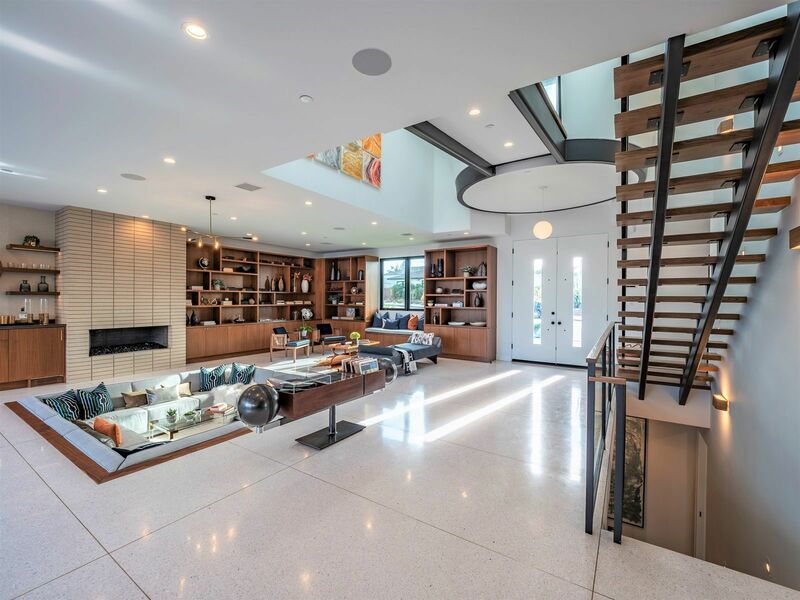 In front, a bridge leads to the dramatic stone entry, with a pair of ten-foot doors. 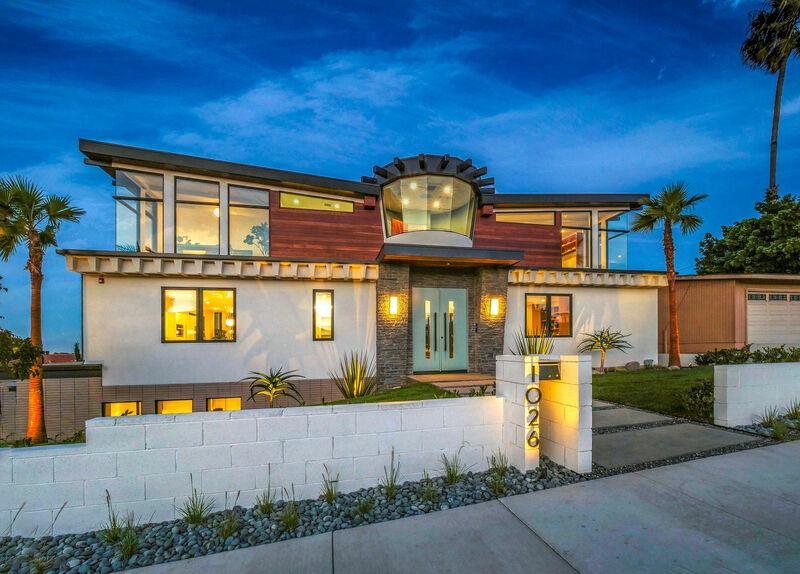 The facade features Ipe wood accents and roof eaves, textured white stucco, Norman bricks, and a unique egg crate overhang detail patterned after the famous Sunnylands Estate in Rancho Mirage. 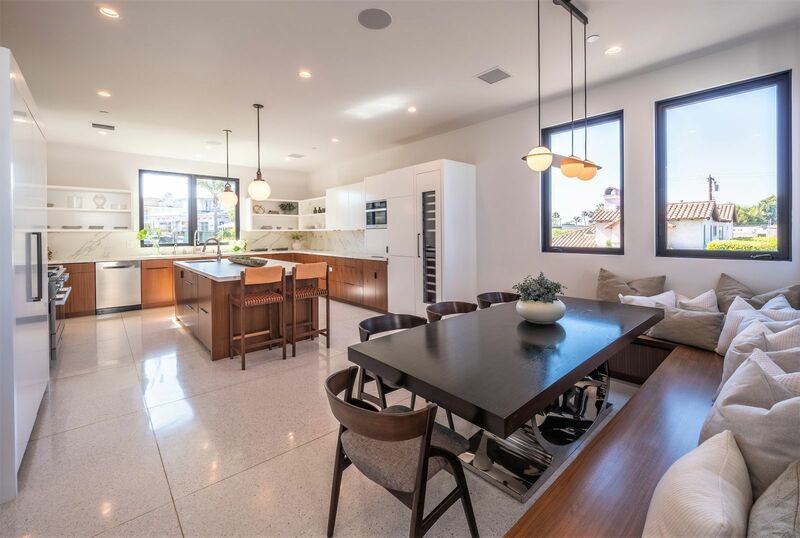 Ground Level: Large double doors lead to a sprawling open floorplan with real terrazzo large format tile flooring. 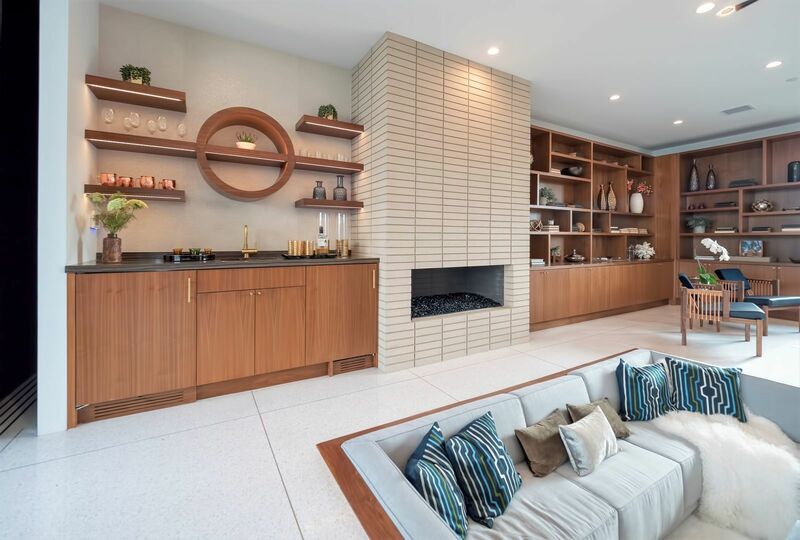 The level features a high volume living room with a sunken conversation pit and an open linear fireplace, a stylish wet bar, and beautiful walnut cabinetry. 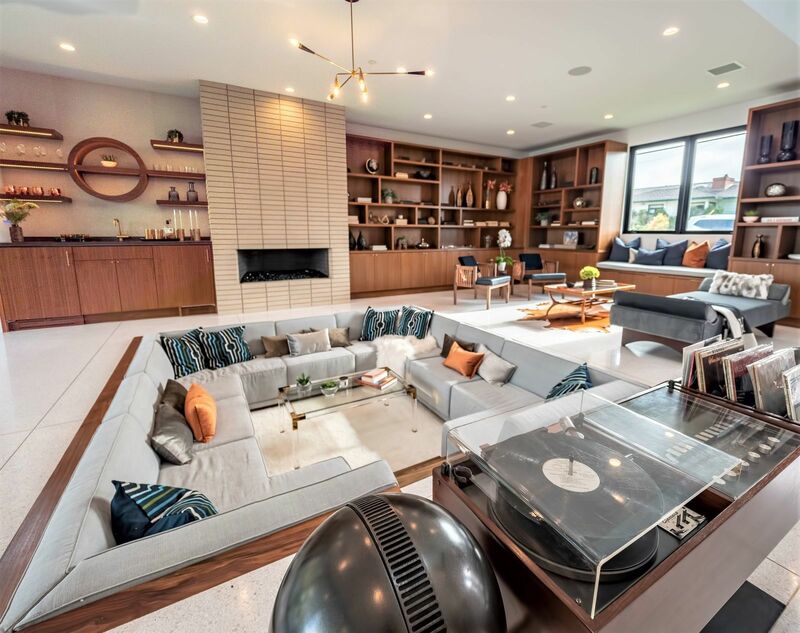 Both the living room and elegant dining space open to the outside with ten-foot stacking sliding glass doors, leading to a covered patio space and grassy private yard with an outdoor cooking center and lush landscaping. 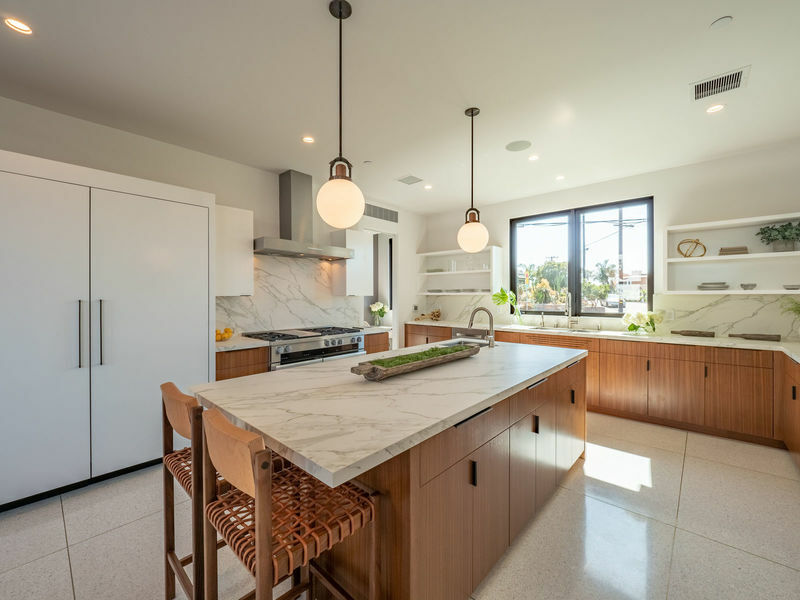 The entertaining kitchen, designed by noted local celebrity chef Pamela Salzman, features Miele appliances -- a dual fuel range and a 60” refrigerator/freezer, plus a wine column, refrigerator drawers, steam oven, and dishwasher. 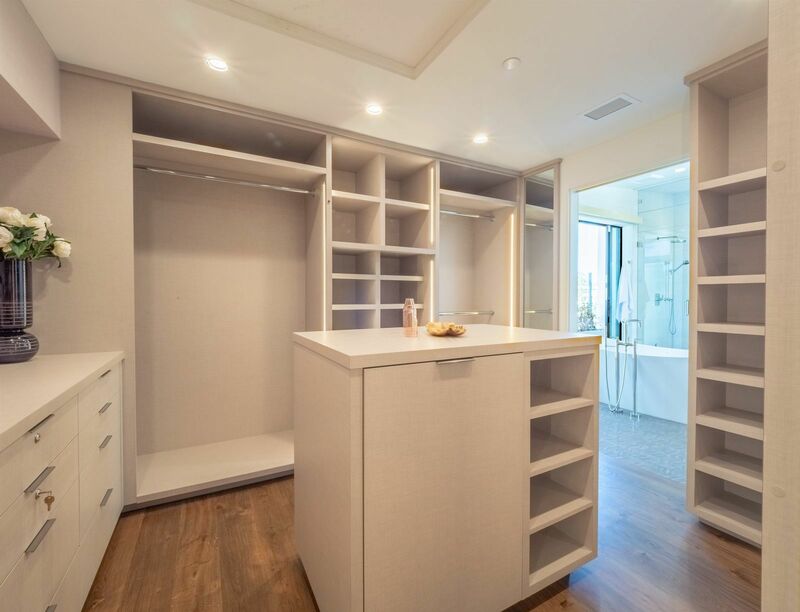 The large walk-in pantry features abundant cabinetry, magnetized wallpaper, and a desk, and the kitchen has a large eat-in dining area with built-in seating. 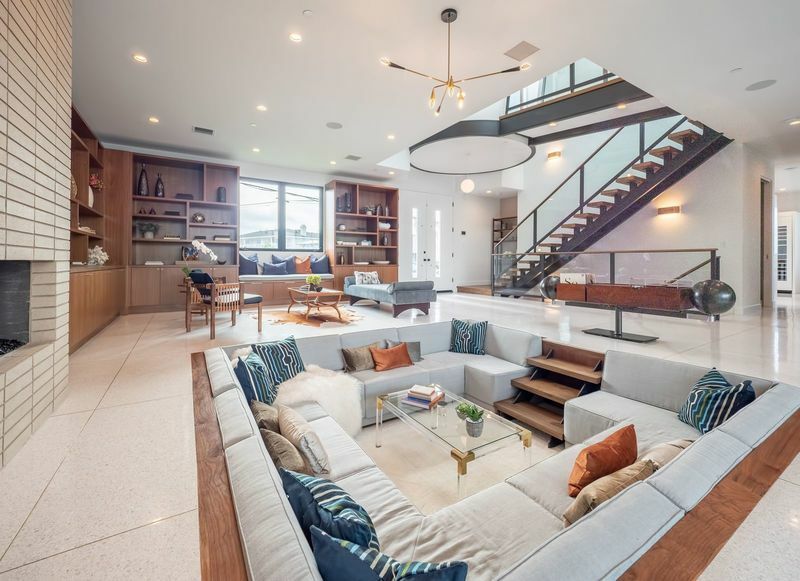 The step-up family room features a soaring beamed 16-foot ceiling with expansive glass and a dramatic stone fireplace that wraps around to the outside. 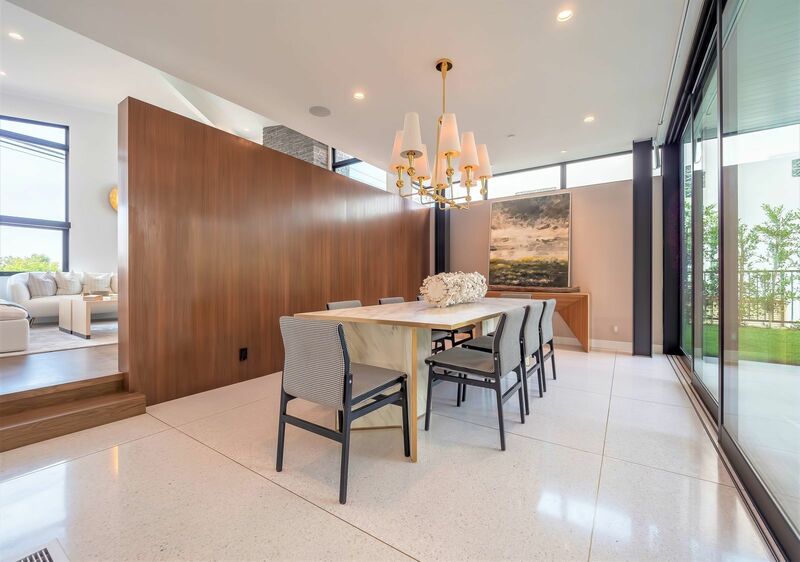 A beautiful floating walnut wall acts as a buffer to the formal dining area. 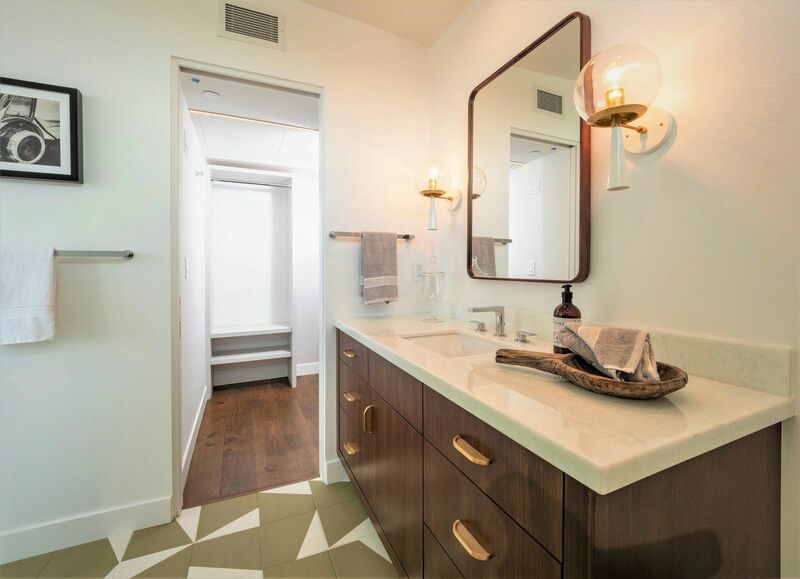 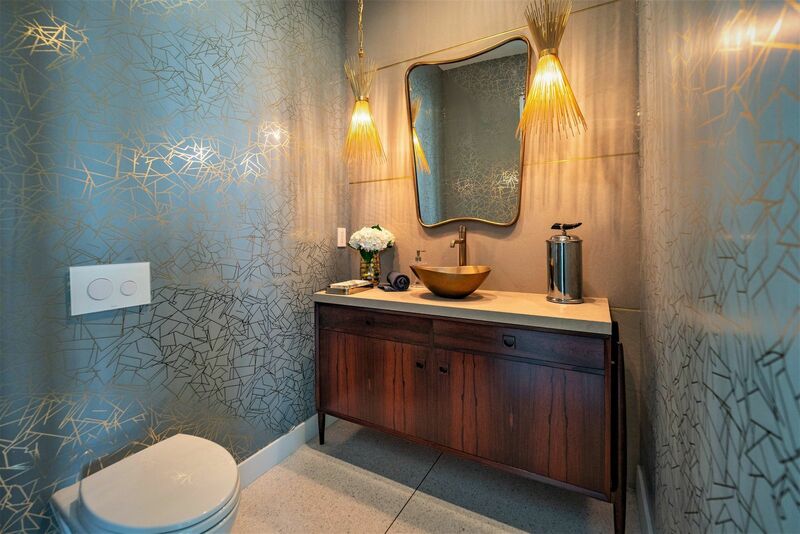 The powder room features a midcentury vintage rosewood piece with graceful legs that float outside the cabinet. 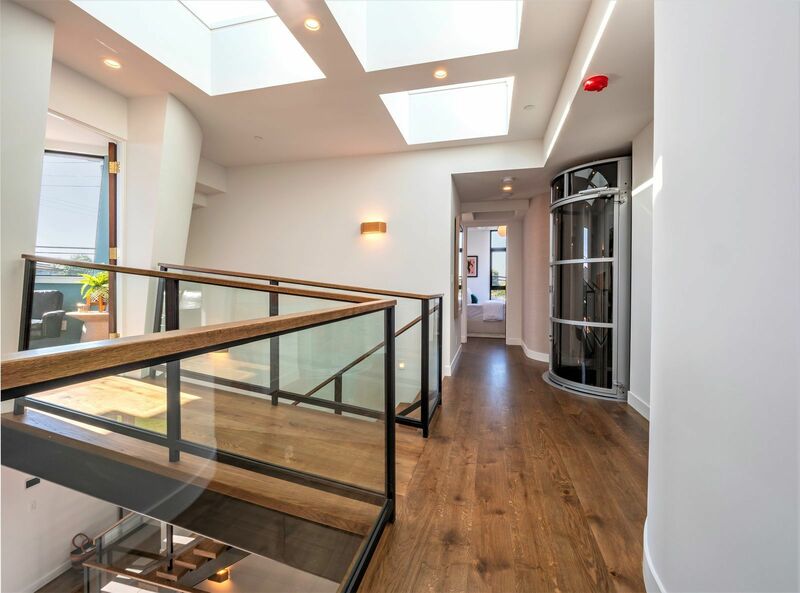 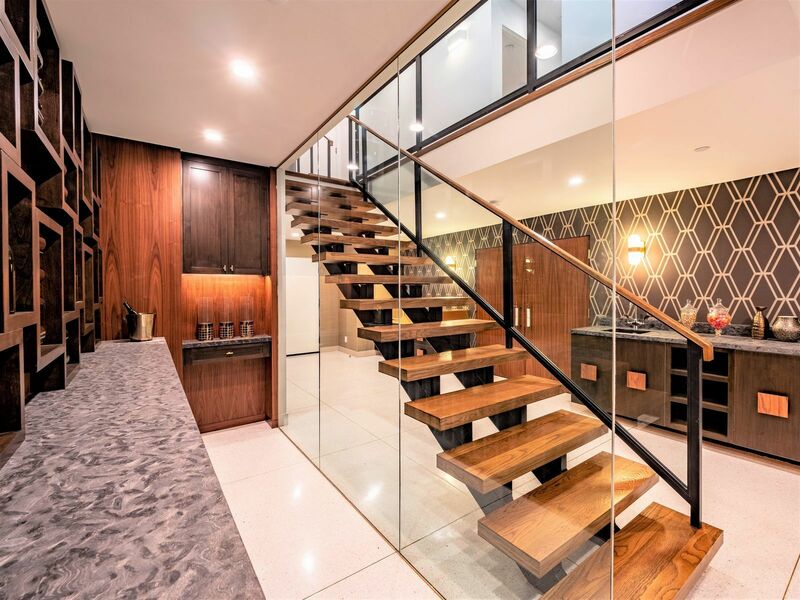 The Upstairs Level: The family level features four ensuite bedrooms plus a steel bridge to the floating crow’s nest, perfect for a private office or meditation space. 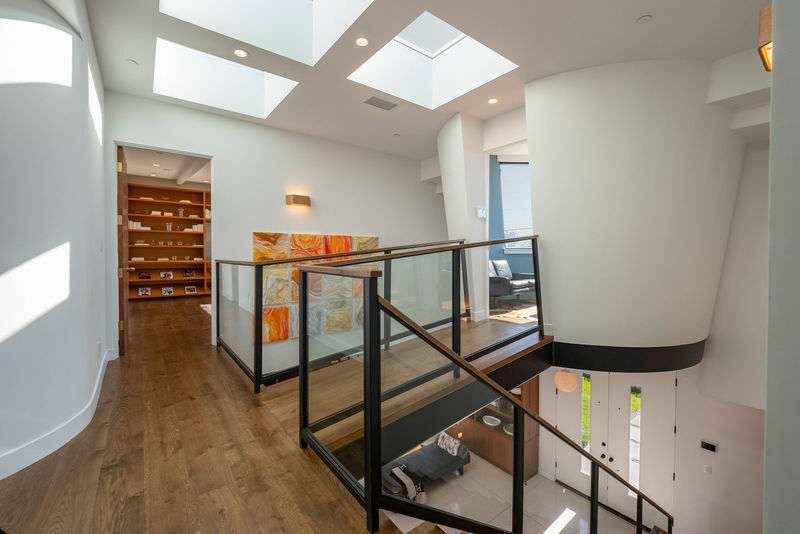 Four large operable skylights naturally cool the level and brighten the space with light. 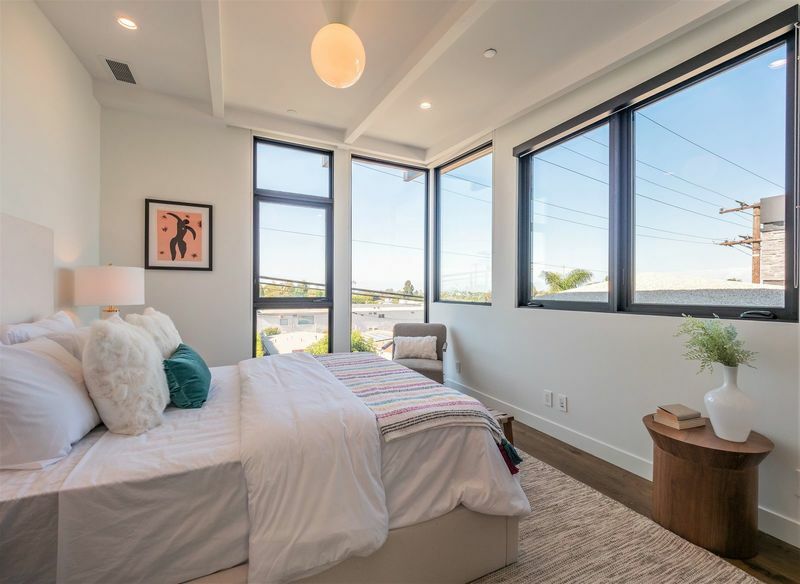 The master suite features floor-to-ceiling windows, fabric-ready motorized drapery tracks with wireless control, a beamed ceiling, and dramatic teak cabinetry built-ins, including bookshelves and a wet bar with instant hot water. 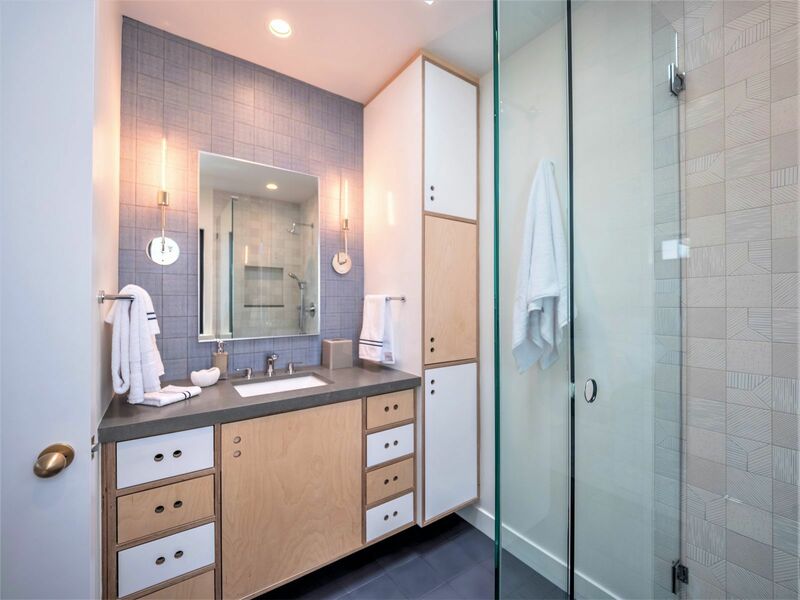 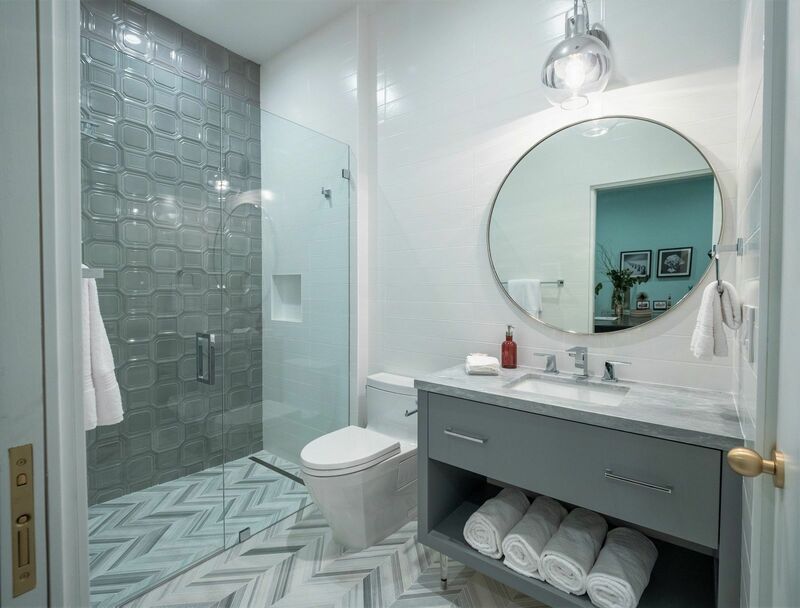 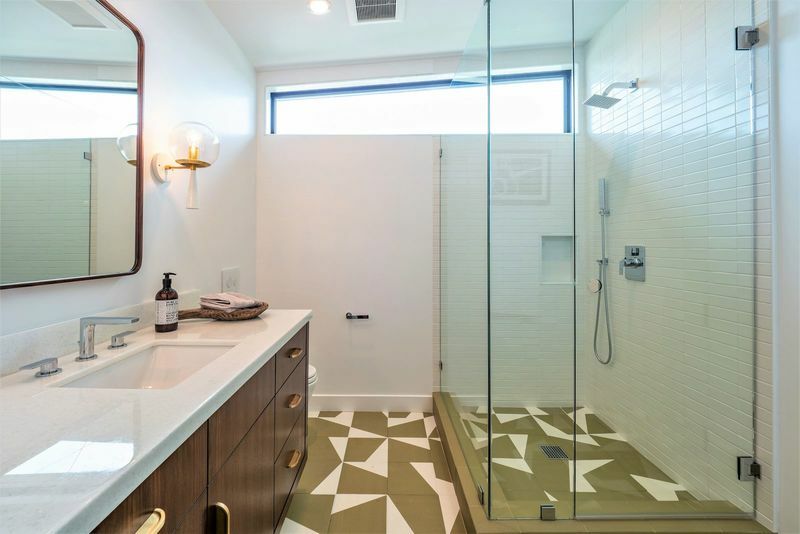 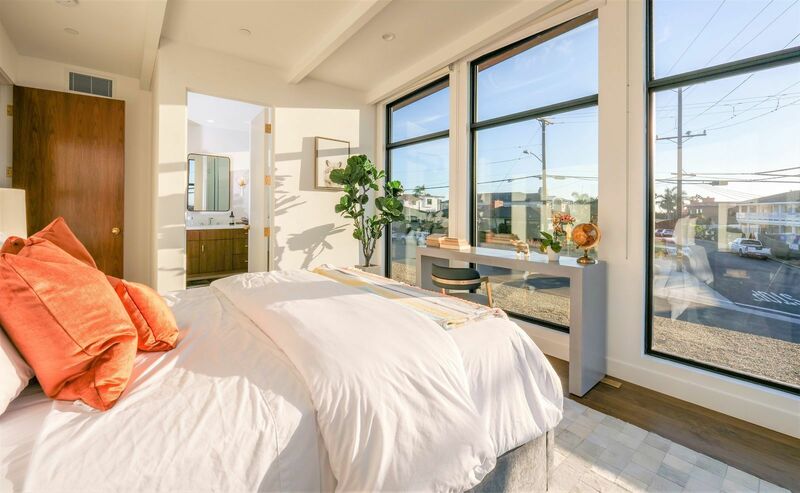 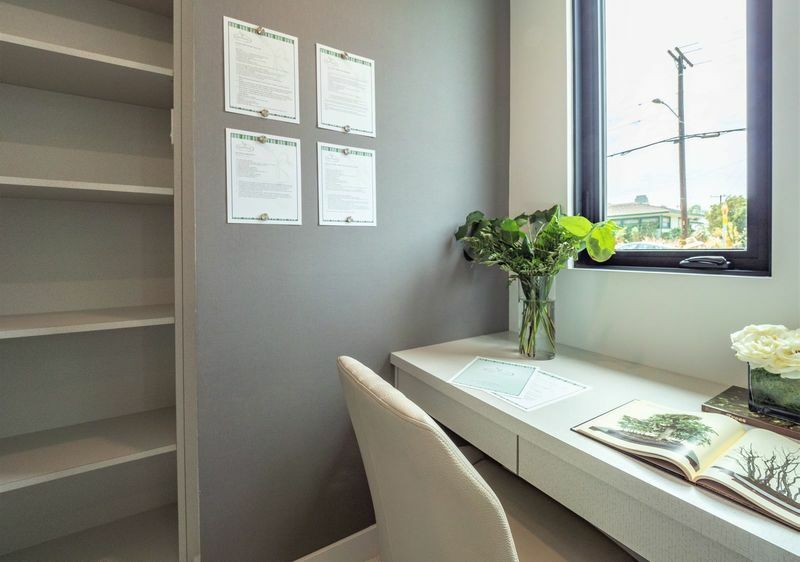 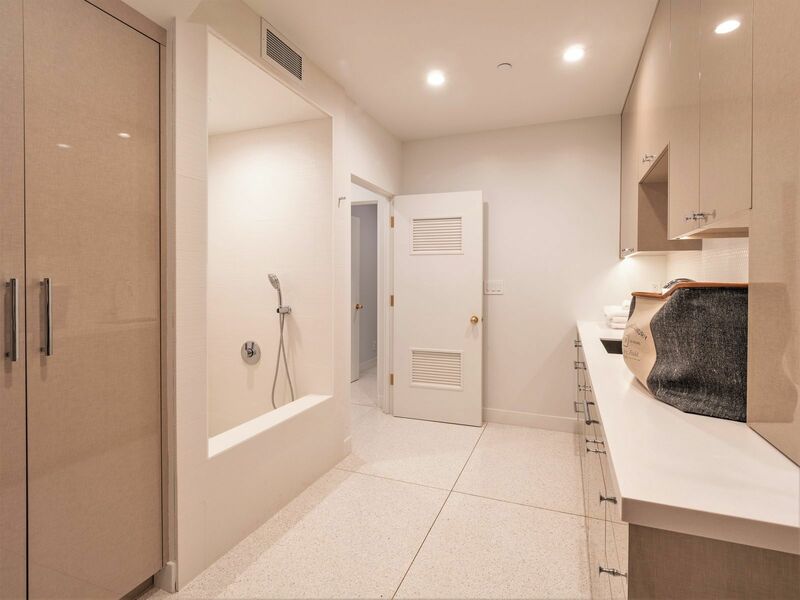 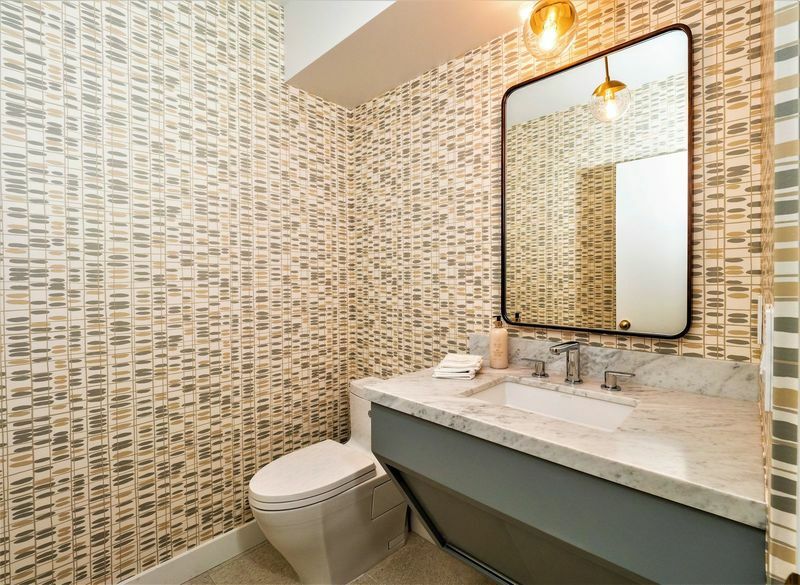 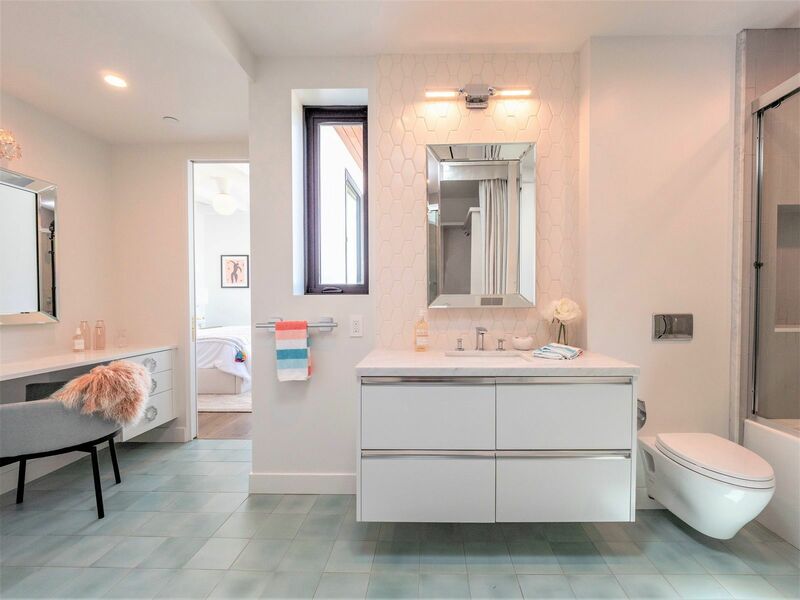 The large bathroom has elegant wall-to-wall tile, a steam shower, a freestanding tub, a Toto Neorest bidet toilet, a supplements medicine cabinet, and the opens to a balcony with an outdoor shower and a green wall for privacy. 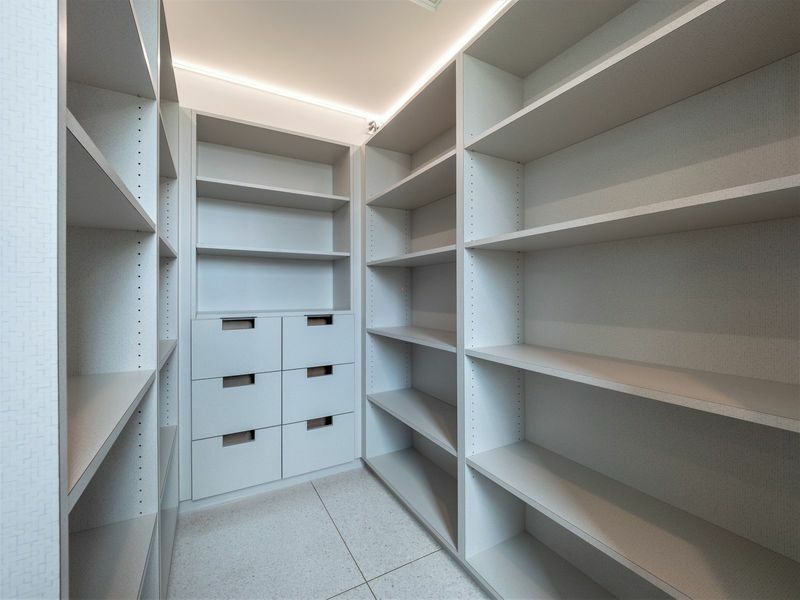 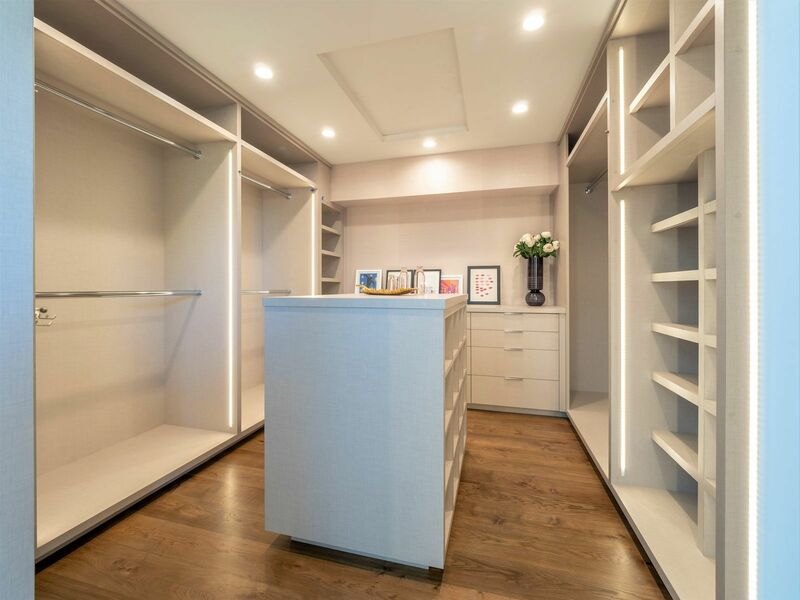 The large closet features full custom cabinetry and LED accent lighting. 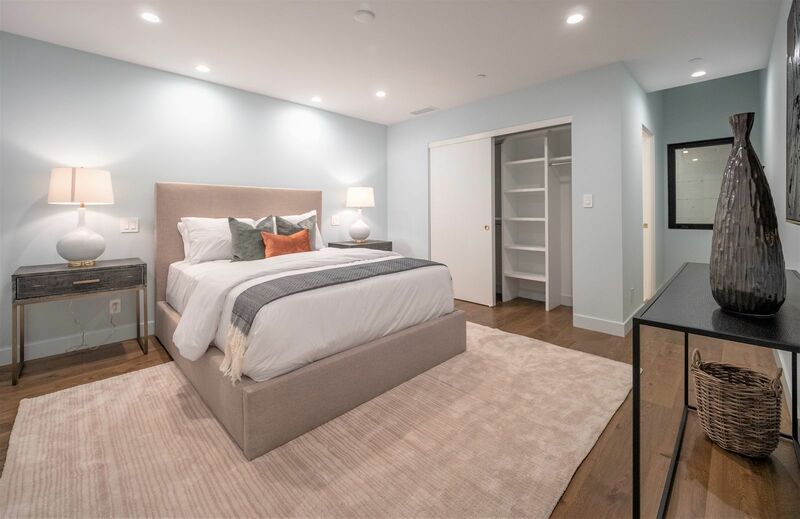 The three other bedrooms all feature custom bathrooms with built-in closet cabinetry and vast expanses of glass in the corner bedrooms with custom roller shades. 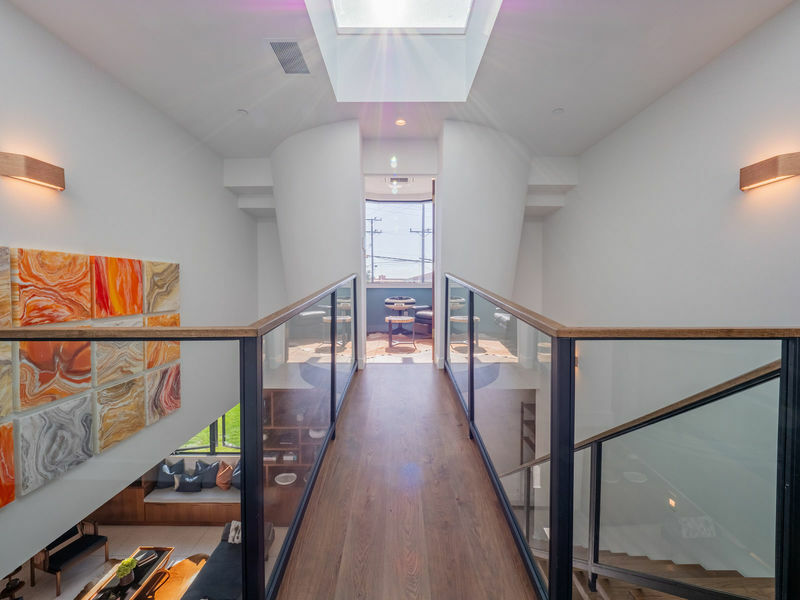 The floating crow’s nest and all the baths upstairs have operable skylights. 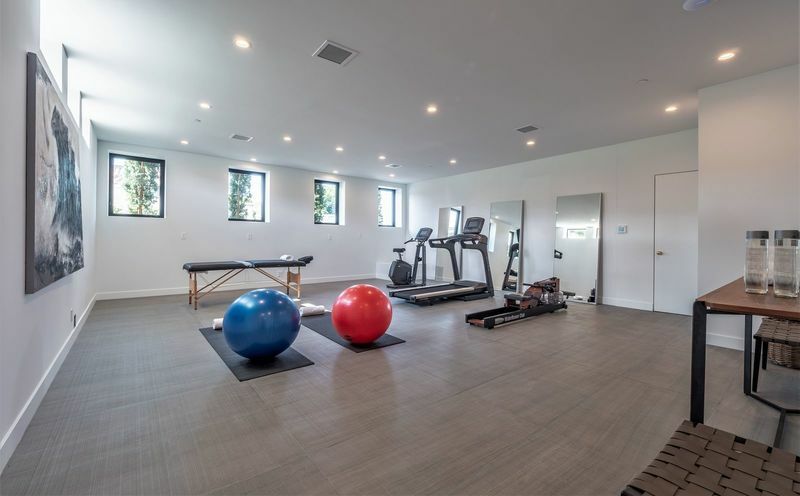 Basement Level: This level features a large 483 SF bonus room with tons of natural light, perfect for a home gym, rec room, playroom, office, etc. 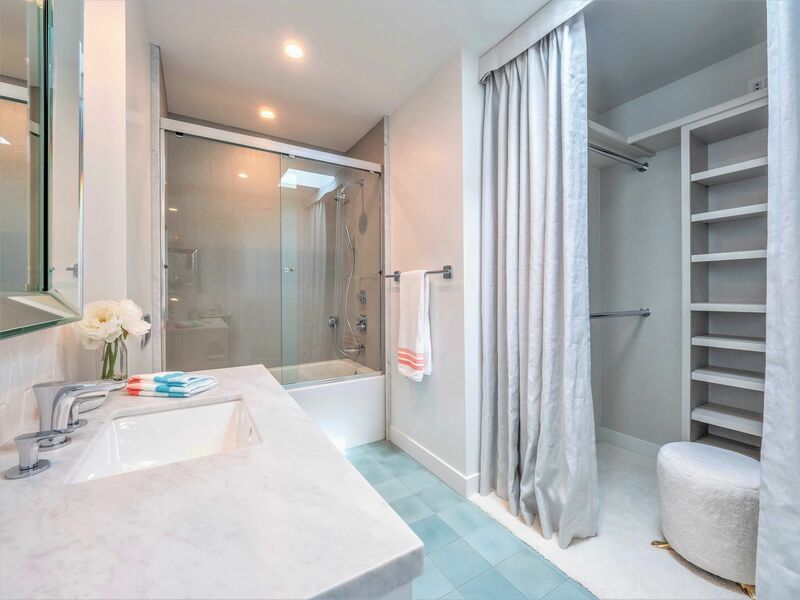 There are two large ensuite guest rooms with beautiful baths. 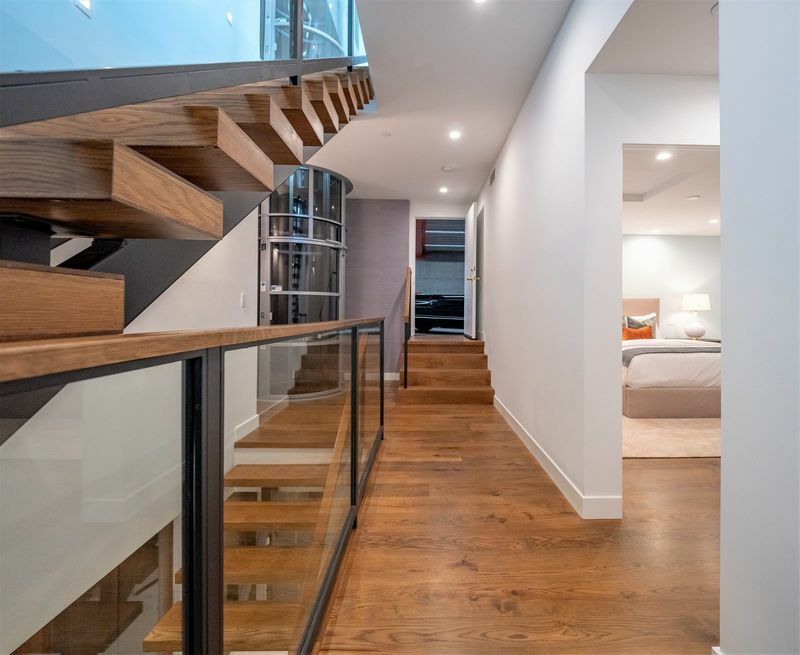 This level has an incredible five-car garage accessed from 11th Street, with an optional Phantom Lift (available at an extra cost) to access the lower garage’s potential four car parking, for a total of 9 cars. 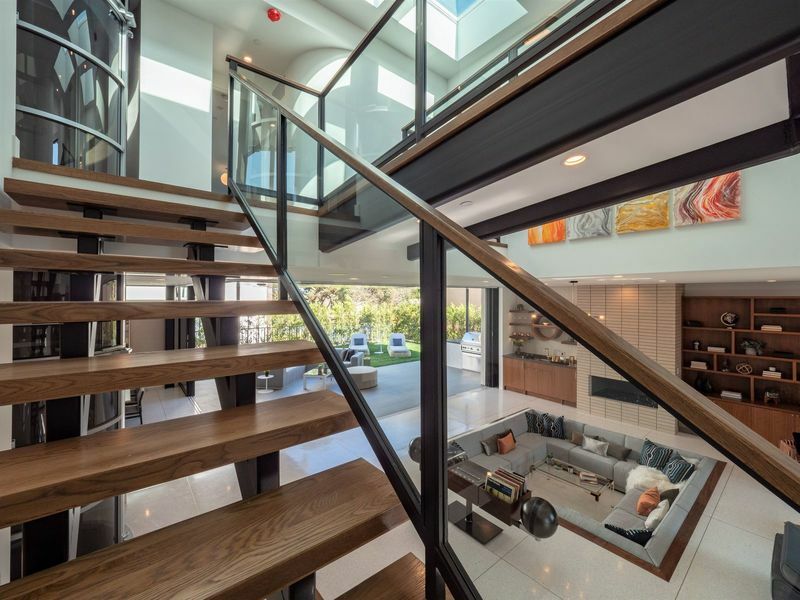 The garage has a ventilation fan that runs periodically and is available on the home’s Control 4 automation system. 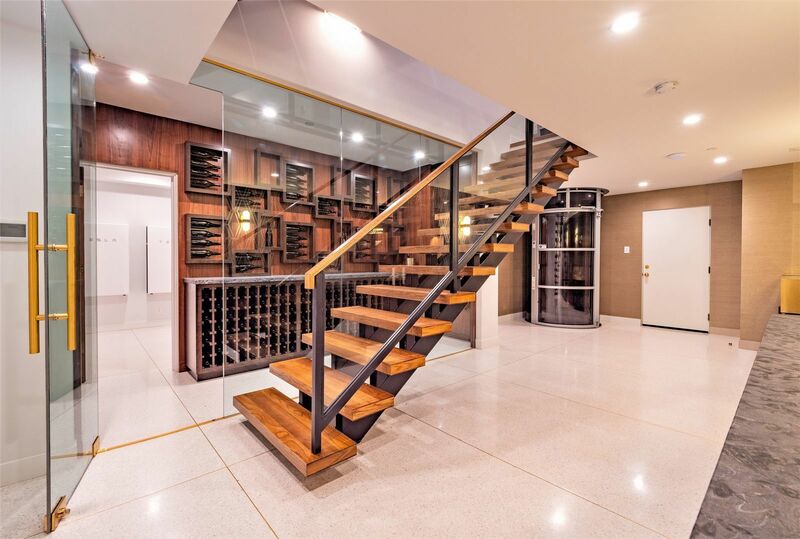 Lower Basement Level: This entertaining level has it all. 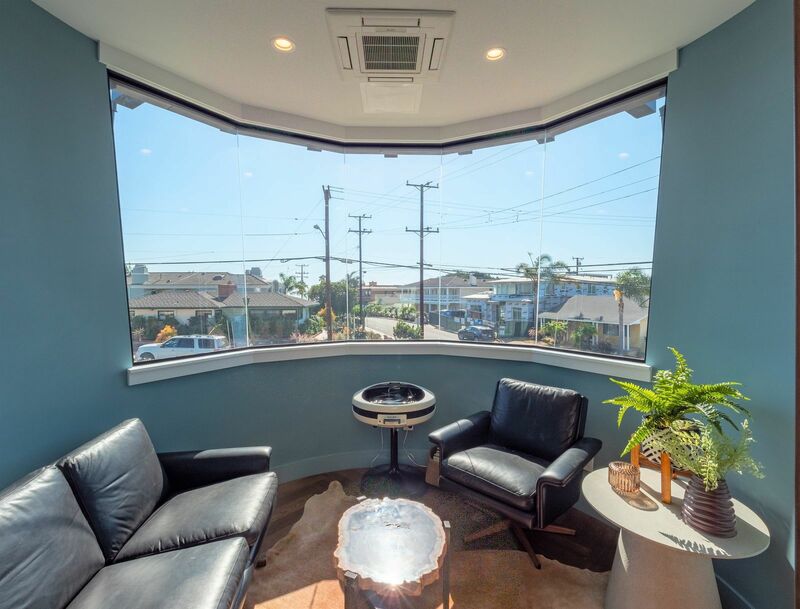 A large stadium seating theater is outfitted with 9.1 surround sound speakers in the walls, and ready for a 120” screen and projector. 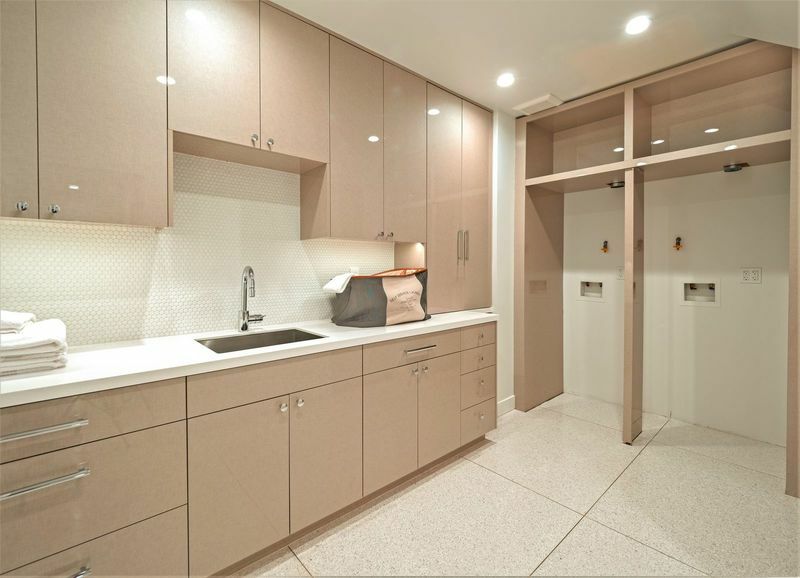 Outside in the Theater Lobby is a wet bar, refreshment candy case, and the theater powder room. 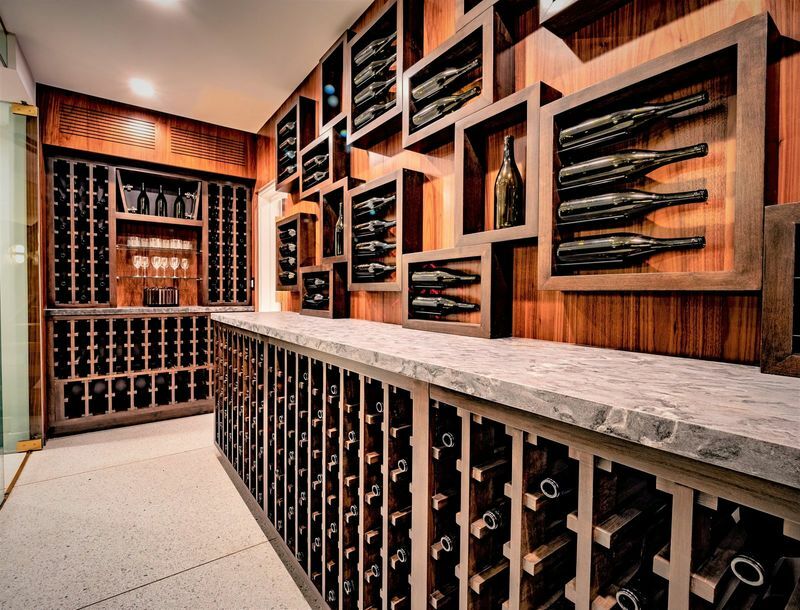 Facing the theater is an equally dramatic temperature-controlled glass-enclosed wine room, with custom display shelving. 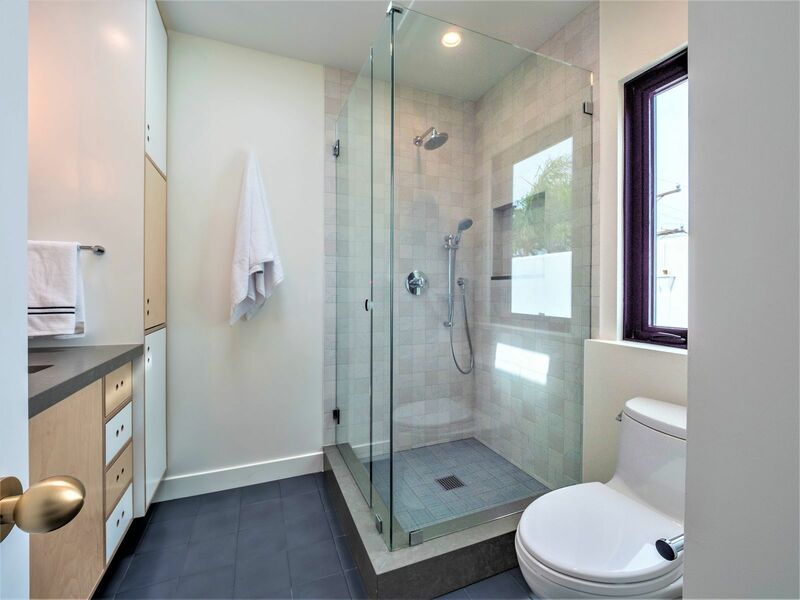 The level has a large laundry facility with dual laundry and a pet shower. 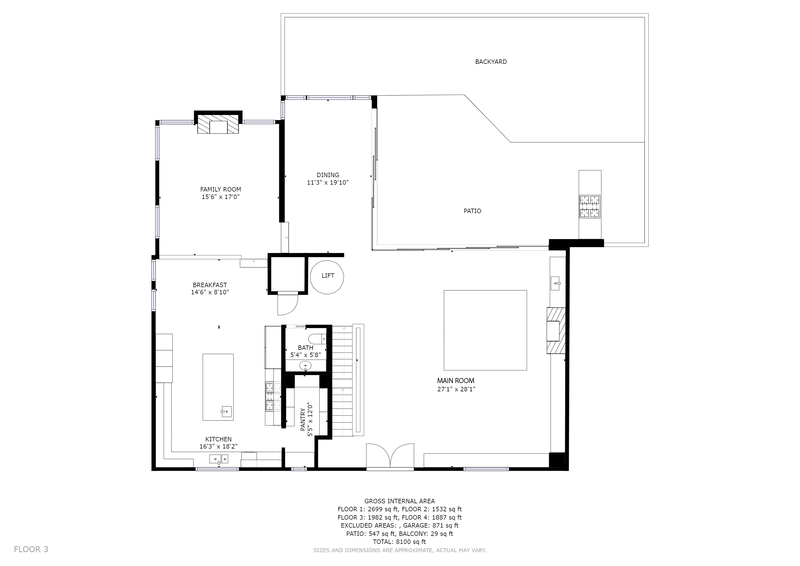 Two bonus rooms are also on the level, along with closets and the AV nerve center of the home. 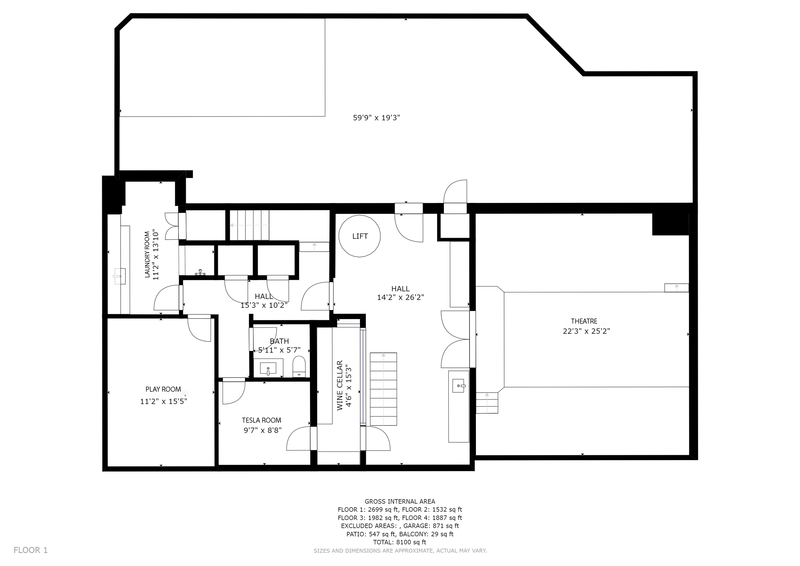 Lastly, there is a 1122 sf lower concrete garage with parking for four vehicles. 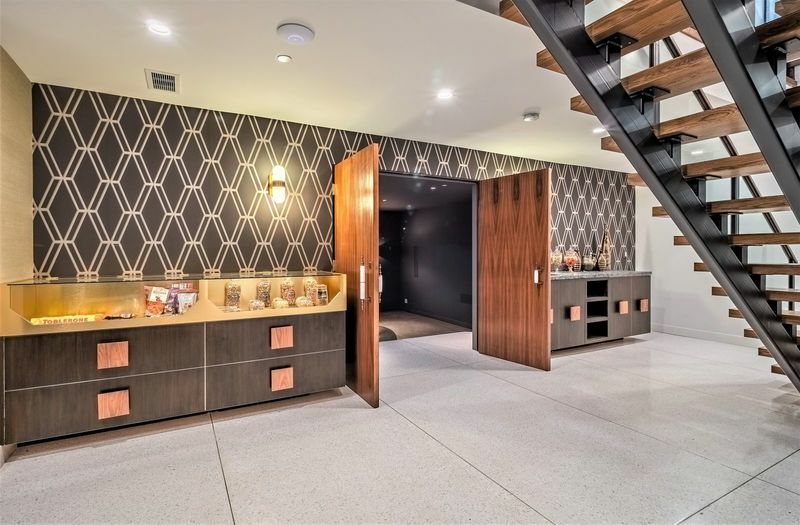 The lower garage space is convertible to a maker space, storage room, a game room, spa space, workshop, gymnasium or whatever one desires. On every level, HillHouse No. 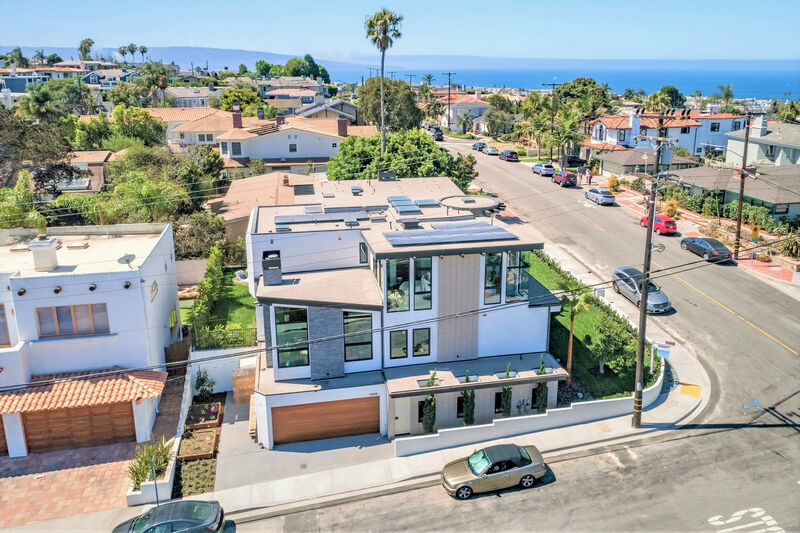 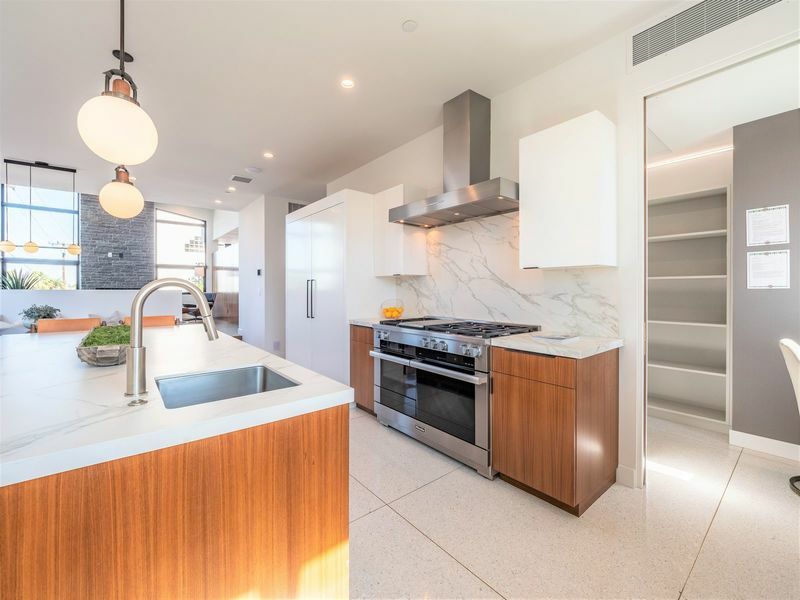 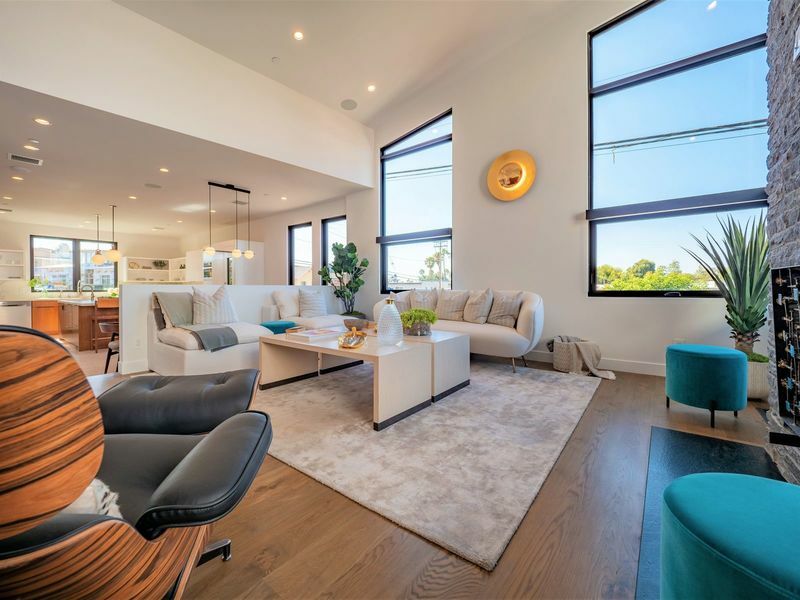 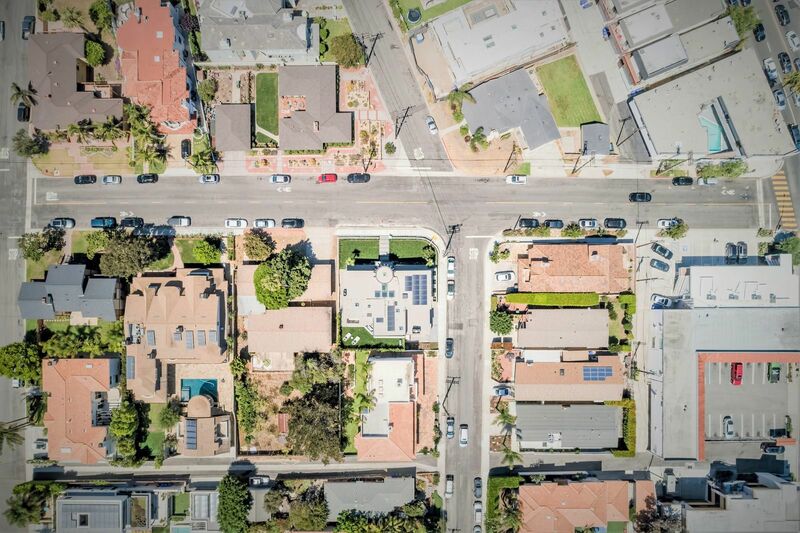 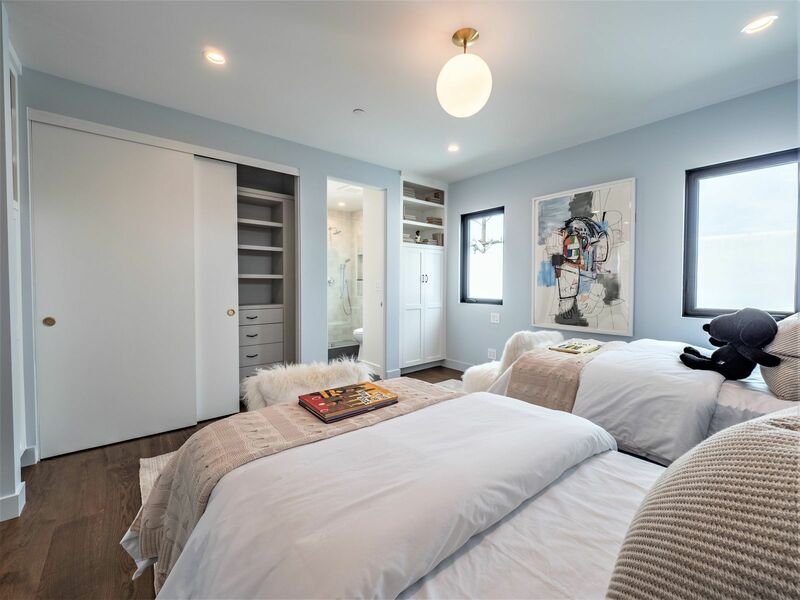 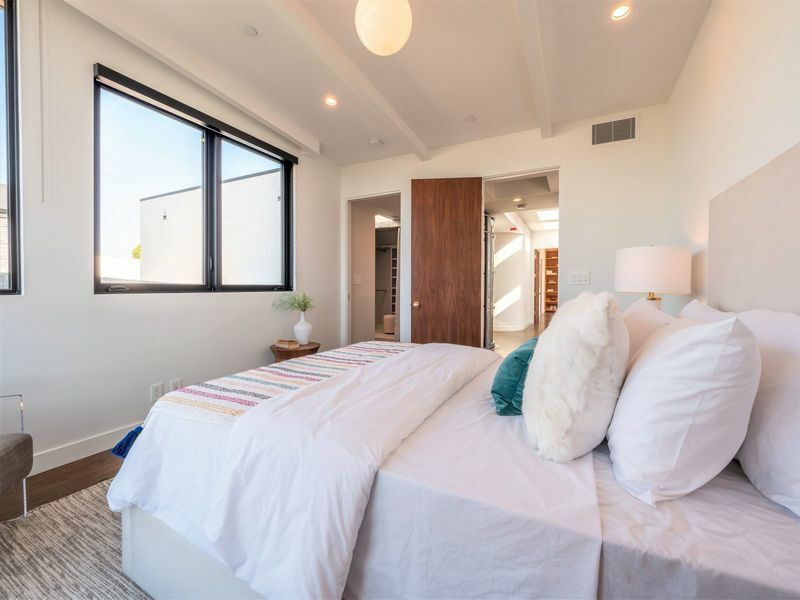 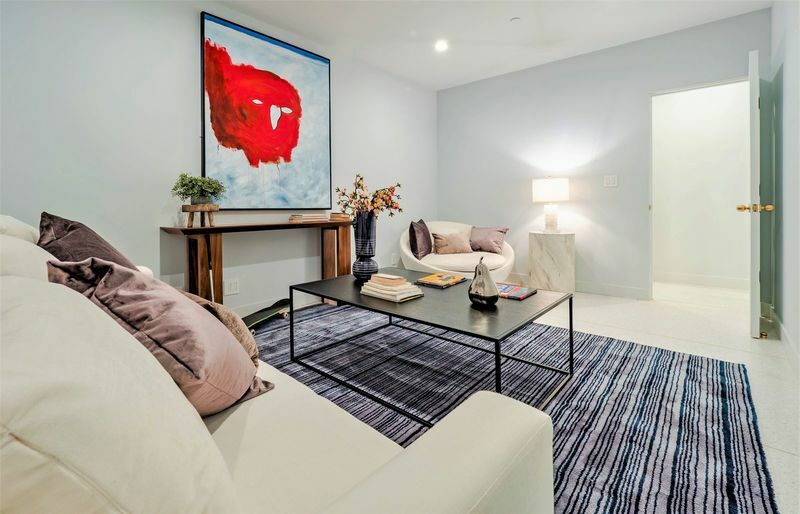 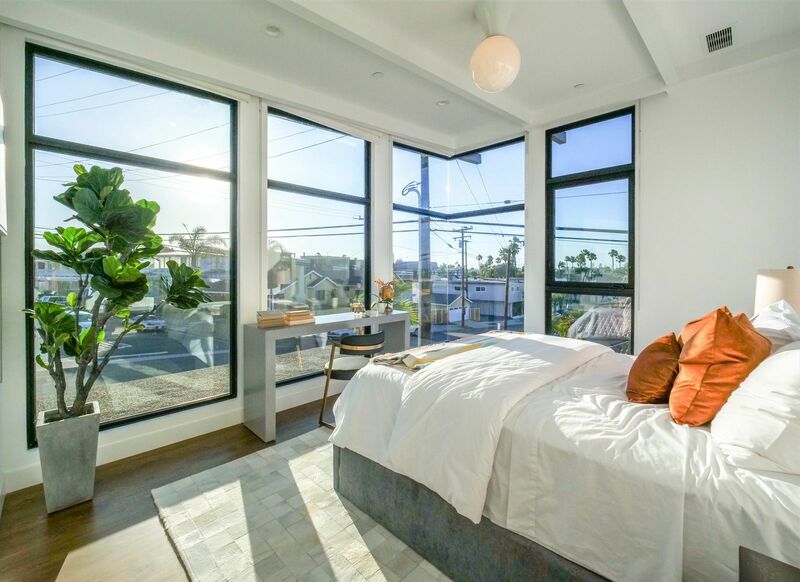 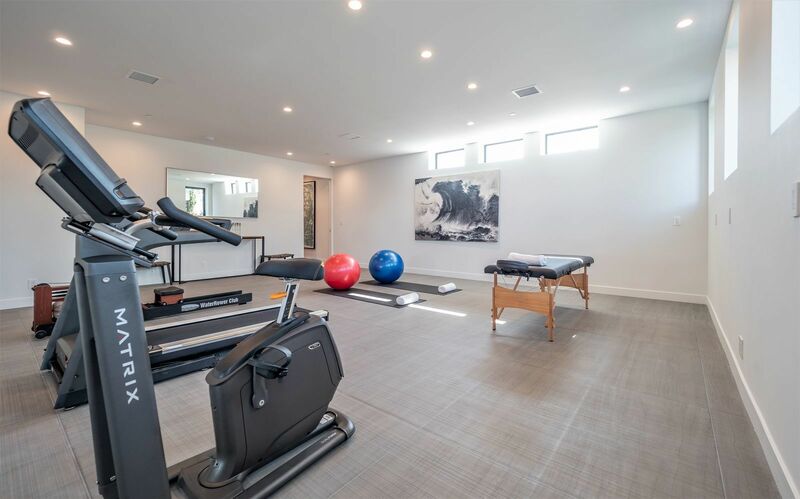 6 exceeds expectations and offers rare amenities, wrapped in a modern midcentury package within walking distance to downtown Manhattan Beach and the Pacific. 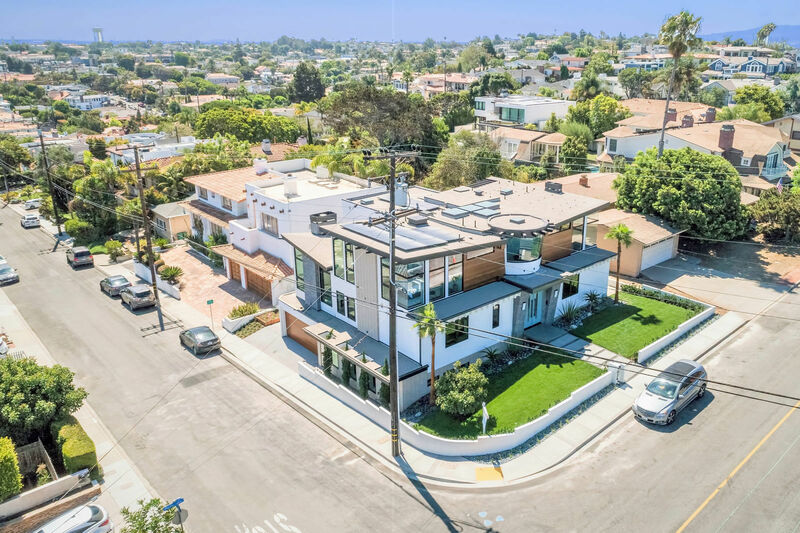 Broker/Agent does not guarantee the accuracy of square footage, lot size, zoning, rent control, permits, use code, schools and/or other information concerning the conditions or features of the property provided by the owner or obtained from public records or other sources. 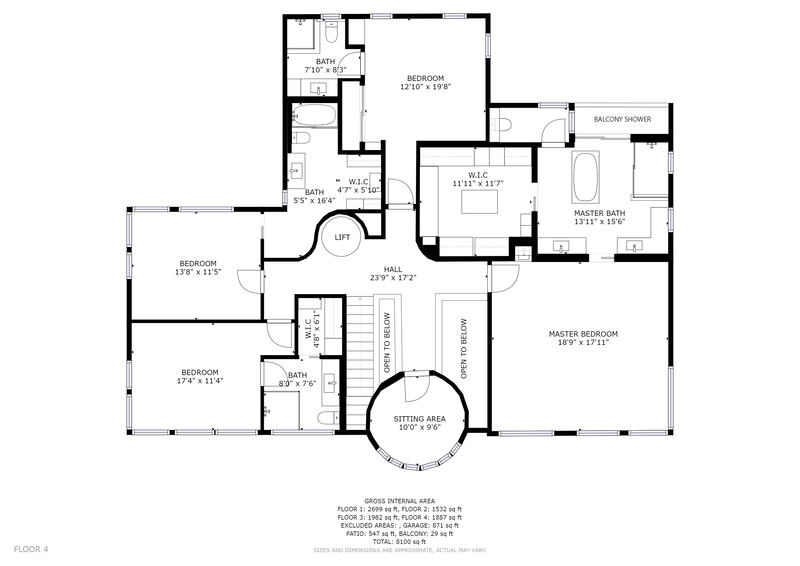 The source of the square footage on the MLS and in advertising materials is from the builder and/or architectural plans. 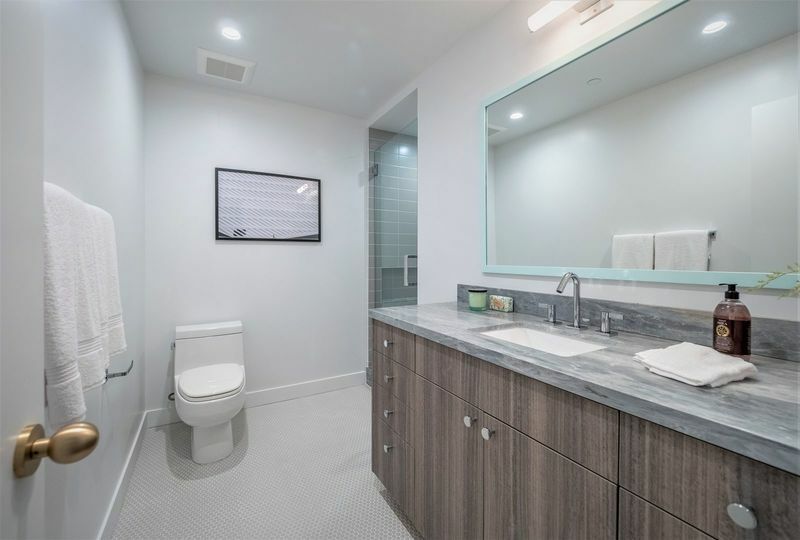 Buyer to verify the square footage to their satisfaction.